Today's post is one that's filled with a little bit of this and a little bit of that. You will notice the tulips on my dining table are nearing the end of their life. As you see from the photo above, I've taken full advantage of their every stage and am now enjoying their papery translucence just before they completely fade off. Interestingly, I took this photo earlier this morning, but now hours later this yellow beauty has since dried up and called 'er done. Since it's only Monday, I can't call this my Five on Friday, but you will see I've used a similar format. I hope you enjoy the moments you spend here today! And that your heart finds something peaceful, hopeful, and a little fun. Bring your tea, it's longer than I figured it would be. 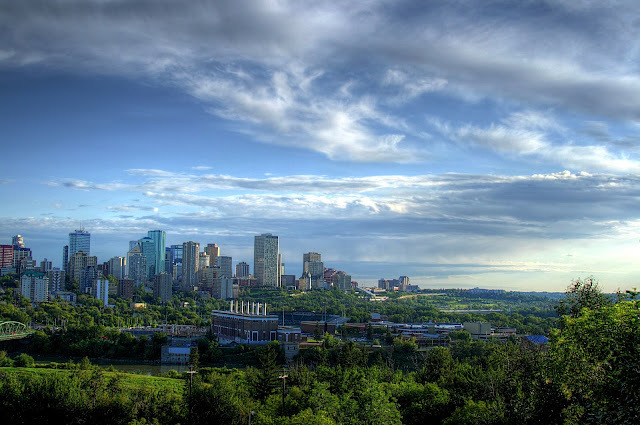 Our region has finally shaken off its winter dullness, and now every morning there's something new to see and marvel at in our garden and neighbourhood. Even though it happens every year, once Spring arrives in earnest, it still surprises me just how quickly--and seriously--the earth begins her process of coming alive, with green shoots and leaves springing up out of nowhere, without notice. Blossom by blossom the Spring begins"
Two weeks ago, most things still looked mostly 'dead'. Hardly a sign of life. 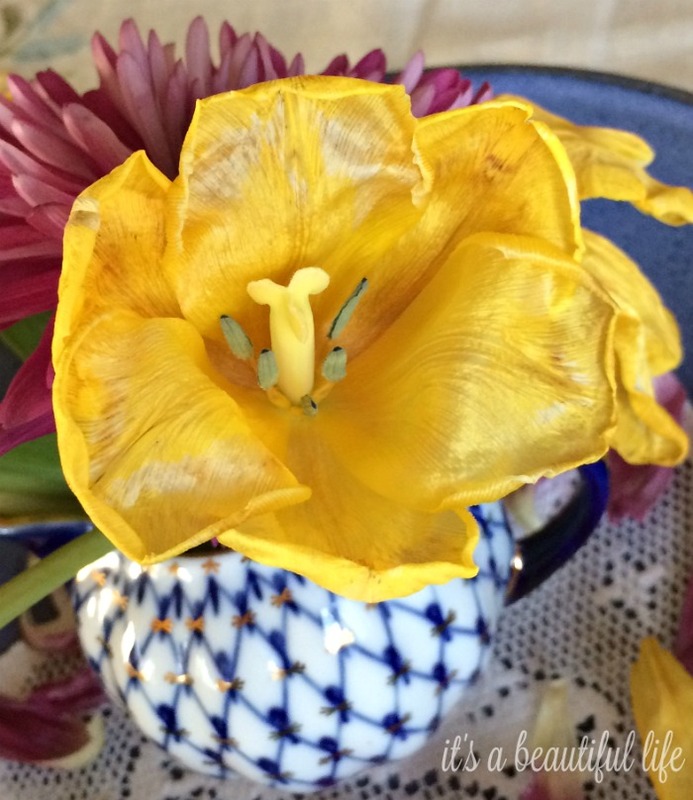 But, early this morning I went out and there were my tulips in full bloom, as well as the gorgeous new day lily I brought home the other day from the garden centre. 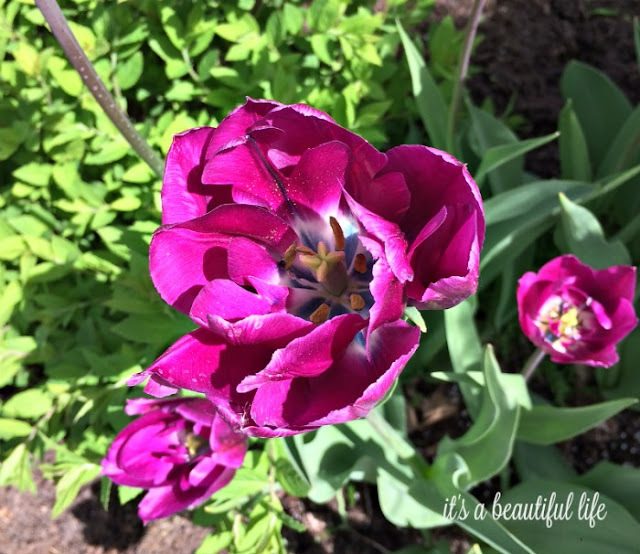 I did not plant her yet, but her eagerness to blossom reminded me of a pregnant woman desperate to release that baby inside, even if she's still in the back of the car or riding the elevator up to the maternity ward. This Venetian Fringe, still in her garden centre pot, sitting by the front step, bloomed right then and there, and she has several buds ready to follow suit. Get me in the ground, Girl! 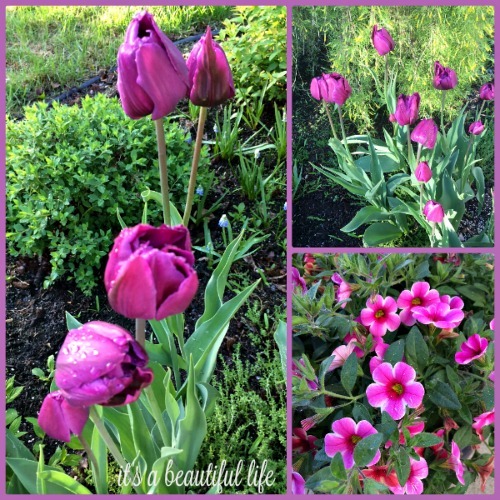 We planted these purple-pink tulips last fall, and we couldn't wait to see them when they opened up this Spring. My, isn't that a gorgeous colour? We're hoping they will spread over the next few seasons. Now, that would be something to see. The pink flowers in a large dark blue pot make a nice splash of colour near our front step. 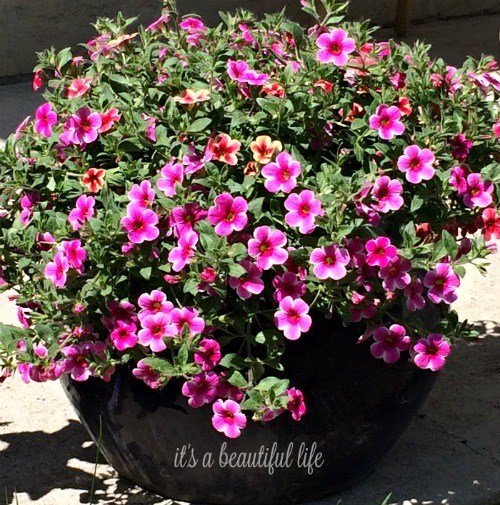 I thought they were a variety of petunia, but somehow I picked up a pot without a tag, so now I'm not entirely sure. Anyone recognize them? Whatever they are, I love their sassiness and that brilliant combo of deep pink with almost reddish centres. create beauty on this earth..."
Journals for me are 'pour out' places. They are tools that help assuage my inner need to put pen to paper. A question I have asked myself often, why do I write? I write so that hazy thoughts can come out into the light of day. I write to discover what I'm really thinking. I record a bit of diary to track things like the weather, facts and figures of events, special and ordinary. I journal to track my inner life, what's making me happy, what's unsettling me, what's weighing on my mind about personal matters or the world at large. My notebooks are a catch-all for anything I'm thinking about when I sit to write: goals for better health; inspirational quotes that lift me up; prayers I pray for myself or other people; ideas for new posts, my to-do lists, birthdays I don't want to miss, etc. . My journals are much like this particular post -- a little of this and a little of that. My journals are work horses, so for me, it's not possible to keep it all pretty and in perfect penmanship and without 'typos' or crossed out words. It is what it is. Still, I do love notebooks with eye catching covers, ones that are nice to hold in my lap and will stay open when I write. The pages must be wide lined. Narrow lines give me a slightly claustrophobic feeling, like maybe the words will squish up to each other and won't be able breathe out their proper meanings. I love to use stickers -- I like floral, vintage, or whimsical designs. I've tried three-dimensional ones, which are gorgeous, but they do leave funny humps in the pages, making it hard to write on. So when I cannot find what I'm looking for, I clip out pretty magazine pictures and use them to decorate the insides of my journals. With a snip of a scissor and the whisk of a glue stick, they create interest and give me a splash of beauty amongst all those wordy words. The year or so around my 30th birthday, I was into reading everything I could find by and about L.M. Montgomery. I was drawn to her journals, which were gradually being edited and published for the public at the time. Having read every one of them, I had a firsthand glimpse of how this amazing woman used her journals to create a historical record of her life as a wife, mother, author. She started her first 'official' journal at age 15 and continued until her death. 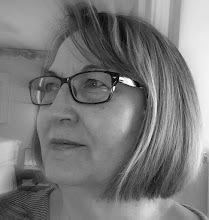 She wrote of her childhood and youth, using a reflective flashback style; she talked about her coming of age, marked her spiritual journey as well as her journey as a writer. She also wrote things about herself she couldn't tell anyone else. I was inspired deeply to write in a similar fashion and so I began my own first official journal the year I turned thirty, which when I add it up, means I have been keeping ink flowing on my pages for over three decades. Before that, I used a spiral notebook to record a few events I didn't want to forget; it was hardly a diary, and certainly not a journal. And, I used big blue scrapbooks to capture glimpses of my adolescent youth, which housed birthday cards, funny notes from friends, the special corsage from Grad Night, programs of favourite concerts and events like the opera Carmen, pictures of the silly things we used to do at college... that sort of thing. So I guess all along, I've been the recorder of my own history. What was it Sir Winston Churchill once said ... "For my part, I consider that it will be found much better by all parties to leave the past to history, especially as I propose to write that history myself." Indeed. I'd be lost without my journals. Anything and everything I need to remember in the here and now, what I think I might want to remember for posterity, and all the stuff I need to get off my chest ... it all goes in there. Most of my old journals are stored up in the top shelf of one closet where I need a ladder to crawl up there. I've re-read some of them, but never all of them. I'm a little afraid of what I will find in there (haha). It's a little like digging over old bones. And sometimes it's a revelation to find that I learned something that long ago (it seems only yesterday). And how many times do I read something indicating that I've been going round the same mulberry bush over and over and over. It's disconcerting, though enlightening, to see that familiar territory turn up, again. Right now they come in handy when I need to reference some detail or date of something for my memoir work. It's all there, well, mostly all there. There are things I fully expect to find, but for some reason, I never recorded that particular event or idea. Truth is, we tend to see more clearly in hindsight. The little idea that didn't seem like much, when we look back, we see it was a life changer, but who was to know that then? I don't know what I'm going to do with them down the road. Perhaps once I write the stories down that keep stirring inside me, then I will feel the freedom to let them go. Then I won't need them. I certainly don't want them hanging around for anyone else to deal with when I'm gone. Or, heaven forbid, to read them. You probably won't be surprised when I tell you that over these last thirty years, I've filled over 160 notebooks, large and small. I do my part to keep the notebook industry alive and well. which hold a unique significance." I was stopped in my tracks the other evening when I took out the June 1989 issue of the Victoria magazine. Holding it in my hands, I was drawn to the date. June 1989. That's almost thirty years ago. Half my age. Who keeps magazines for that long? Well, I'm pretty certain I'm not the only one to hold onto those cherished magazines, created under the guidance of the truly wonderful Nancy Lindemeyer, Editor in Chief. Many a Victoria reader will be nodding her head that she, too, has held on to her now vintage copies. 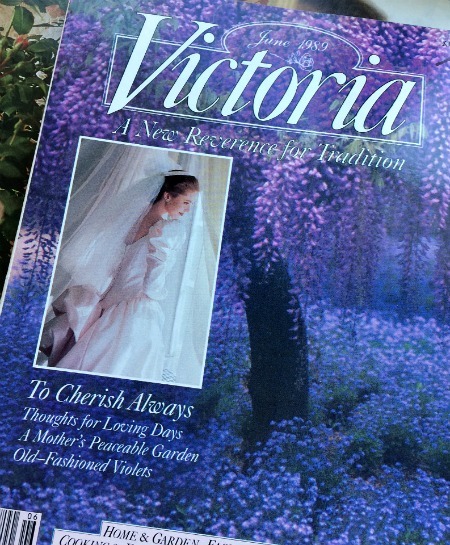 I have the complete set of the original Victoria magazines, published from 1987 to 2004. They are still loved and still read -- oh, there used to be such lovely articles to sink into with a cup of tea. I had a pen pal in those days, Cindy C. and we'd write to each other and tell each other which pages were our favourites. Letters and cards were always crossing in the mail. I still have some of them in my memorabilia boxes. We were kindred spirits. We loved writing letters, we shared this love of Victoria magazine, we loved all things Anne and L.M. Montgomery, kitty cats, living beautifully, being single, gardening ... you name it. Floods of splendid old memories come as I write. Oh my! When I first saw that magazine on the news stand that summer afternoon in 1987, I knew I had an answer to my heart's prayer. Thankfully and gratefully I took that lovely first issue home and read it from cover to cover like an old friend. It gave something to my heart which longed for Beauty. 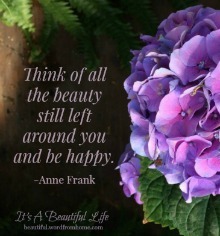 It had lovely articles, gorgeous photography, wonderful ideas for gracious living--it encouraged women to create beauty in their lives and to share it with others. To this day, I'm so grateful for Victoria and the wonderful people who created it and lovingly put together every issue. I'm glad that Phyllis Hoffman has taken up the baton and carried on the tradition as the current editor. It's not the same magazine all these years later, but it's still lovely. FOUR: Countryside or City Dwelling? I lived in the countryside growing up on a farm. Loved it. Loved being close to nature, the fresh air, and wide open spaces near cows and wildlife. I now live in a small city and I like it too. I like being close to the shops when I need something. I like being closer to good quality makeup even if I'm not a big makeup girl (someone left a comment saying that and I realized I liked that too). And, I must admit, after all these years living near neighbours and having street lights, I'm not so keen on being completely isolated and in the dark on a moonless night way out where I can hear the coyotes yowling. I guess I've been away too long. I like knowing my neighbours are around and hearing the laughter when they have friends over in their backyard. I love the sound of lawn mowers off in the distance. And in the night, when I'm wide awake, I look across the way, and see a light on -- sure enough, someone else can't sleep. And that's comforting to me. When I need some countryside, I go out into it and revel in it. I'll go for drives down quieter country roads and visit the national park nearby, spending the day drinking in the wildness and greenery. But, then I'm happy to come home to my house on a city street with lights. 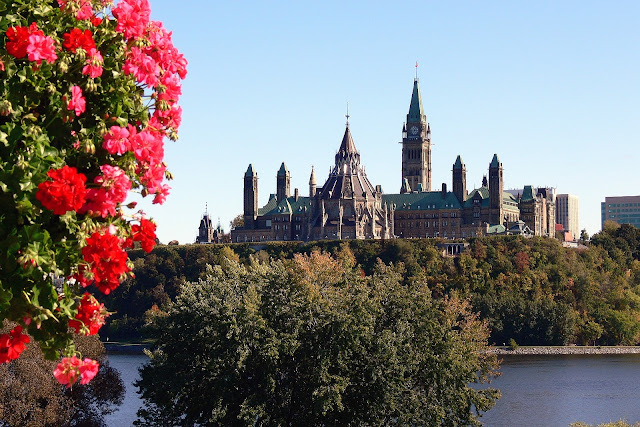 Flying off to Ottawa later in the week with my mom and youngest sister. We're off to visit my brother and his family for a few days -- they recently moved to the region. We're looking forward to seeing their new home and spending time together. I talked in a recent post click here to read about starting a new segment on my blog. You'll recall I still want to write about living a beautiful life, but that I am looking for a new focus, something fresh to write about. There's a story I've been wanting to write out for a long time now. 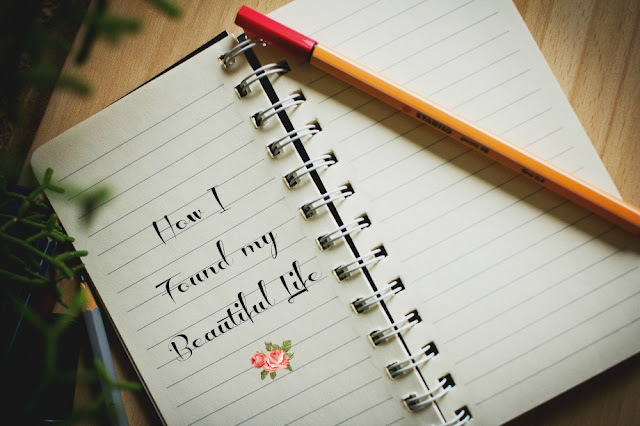 It's the story of how I found my beautiful life. How, when I found myself 30 years old and still single, I realized my long cherished dream of being a wife and mother by age 22 or 23, at the very latest by 25, was long past its due date. I found myself in a season where I wanted new dreams, even as I still hoped for love and marriage one day. It became a life-enhancing inward journey of discovery. When I look back at it all, I marvel at how God directed my steps and brought me into a place of wholeness, beauty, and joy. I'm titling this part autobiography/part memoir How I Found My Beautiful Life. There's a glimpse of it in this post -- in the sections on my journal writing and finding the Victoria magazine. I plan the next episode early in June, around the 8th. The day was beautiful and the evening is almost done too. I spent my day writing and working in the garden. The robins sang their evening vespers some time ago. The sun is long set. Let me wish you all a beautiful wonderful week ahead -- may you catch many glimpses of heaven in unexpected places. Grace and Mercy to you all! beautiful thoughts, for a lovely book to be. 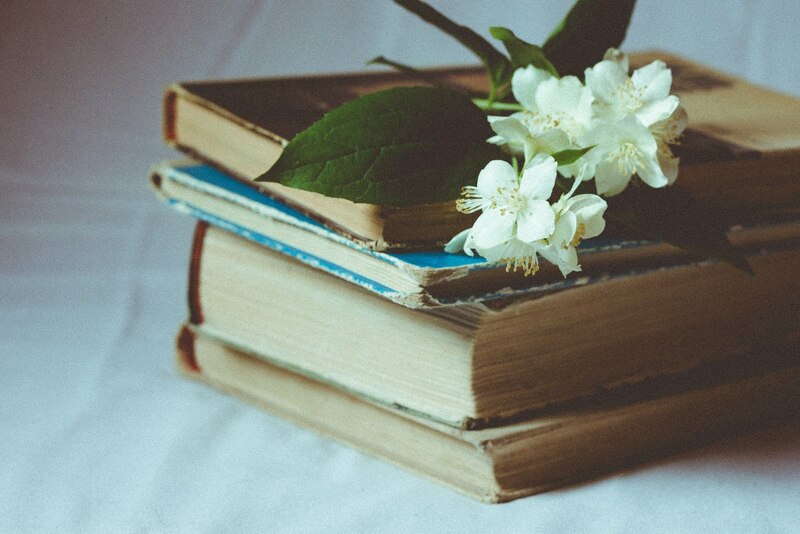 i too keep journals or have since 1960s that's 50 years or so, every once in awhile i reread and relive experiences and see my growth, new understandings and strengths that come as I lived through the trials that are part of life...thanks for sharing! I do not journal as regularly as you do, but had to laugh at the going round the mulberry bush comment, for when I return to my journals from time to time, I see that I, too, repeat my thoughts. Variations on a theme, as it were. Victoria magazine was a life changer for me, too, in many ways. I discovered it on one furlough and bought a subscription to it. It arrived months late to Ecuador, but that mattered not one whit. I called it the "thinking woman's magazine," and was always surprised to find those who didn't like it very much. When I found someone who loved it as much as I did, I knew I'd found a kindred spirit. Unlike you, I am beginning to let my collection go. I'm paging through old issues, keeping one or two and sending the remainder to the thrift store where I know another kindred spirit will enjoy them. Haha, Lorrie, variations on a theme indeed! There are times and seasons for everything, including our Victoria magazines. I commend your courage to pass on your loved copies to other kindred spirits. Brenda - such a beautiful post. I too love those Victoria Magazines...have a few on my shelf as well - not certain the dates...will be looking forward to reading how you found your beautiful life. Also going to look into L.M. Montgomery. Being a journal keeper for too many years to count feel like you and I and she are kindred spirits. Have a super day friend. Many Hugs! I so enjoyed this lovely post Brenda. You always have something of interest. I wonder if your nameless flower is Mirabilis? I am growing some and they look very similar. Such a beautiful post, Brenda. I loved your comment : "And how many times do I read that I've been going round the same mulberry bush over and over and over." I don't journal as regularly as you do, but when I look back on the few journals I've kept I'm surprised to see that I'm still trying to learn the same lessons I was learning way back when! And I LOVE Victoria magazine. I always gravitated to the "blue and white" issues. Thanks for the visit.I feel like I've had a lovely, personal visit with you and I love that. Brenda, you know what you said about a small thing in the past becoming a life changer in retrospect? I have a feeling your journals will be that one day, for you or for whoever they find. "Two weeks ago, most things still looked mostly 'dead'." Wow! This line hit me. It is like a prophecy. Oh, I felt the loss in those words at the thought of your grandmother's journals being burned. I wonder if our pride (I talk for myself here) makes us cringe that our inmost thoughts and feelings would be revealed to others so openly. But surely we shall all be without spot or wrinkle and have no thoughts of shame or guilt in the sweet by and by. // I know L.M. Montgomery wrote her journals keeping in mind the possibility of them being share with the public down the road. She left it to her son's discretion to deal with them as he deemed best. As I understand, they became public only after he himself died, which was many years later. Certainly the passage of time and distance makes a difference. I wanted to say how touched I am that you bought one of the Christmas magazines and that you continue to enjoy it even when it's not Christmas. With you in mind, I do have plans to put out another issue, perhaps a Spring/Summer or an Autumn one. I best get at it if I am to do it. Dear Bren, This post is an absolute treasure. I, too, have enjoyed Victoria magazine through the years. I have several of the old issues, but not all of them. I do keep many of the new ones though and it is always such a treat to receive a new issue. Nothing quite like it out there. I love your blog, Bren and always save it for when I can enjoy it. Blessings to you, you are a gifted soul. There you are, Sandra, the bearer of good tidings of joy and beauty. See, something else we share in common, the Victoria magazine. The new ones don't have all the articles the old ones did, but their photography is quite splendid. So many good thoughts. Yes sure love when color emerges after winter's black and white. This year with it going from cold to hot so quickly, you wonder if the plants think they missed a season. You have such pretty journals. Mine are not all that pretty, and not all that organized, but somewhere along the way it has become really enjoyable to write thoughts and ideas down. It sure does come in handy for writing later if you can remember exact dates and events. It is interesting to go back and read what one has written. I am impressed by all your Victoria Magazine collection. That could be really valuable. Perhaps that could be an Heirloom item to pass down to some kindred spirit in your family line. And the debate between country and city life. Yes there are advantages either way. Some of us are in love with the country life for this time. I love that title...."How I Found My Beautiful Life", That will be an awesome addition to your blog. Is that your title/sub-title to your book? Betty, thank you for your lovely comments. 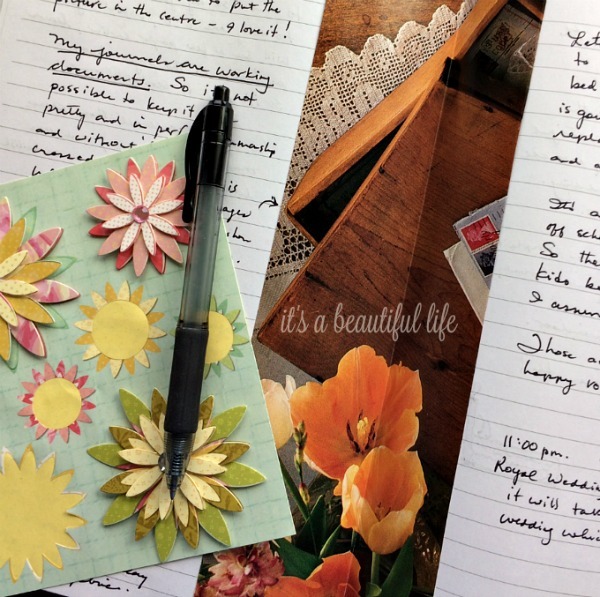 I'm glad to hear that you are enjoying the journaling process. As unique as we all are, our journaling will be that way too. Doing whatever fits for us in our lifestyle and with our personal bent, that's what matters. I appreciate your insight about the possibility of handing down my Victoria collection to a kindred spirit in the family line. I shall keep that in mind! Yes, I know you love the countryside and I'm so glad you can enjoy your beautiful spot on God's green earth. 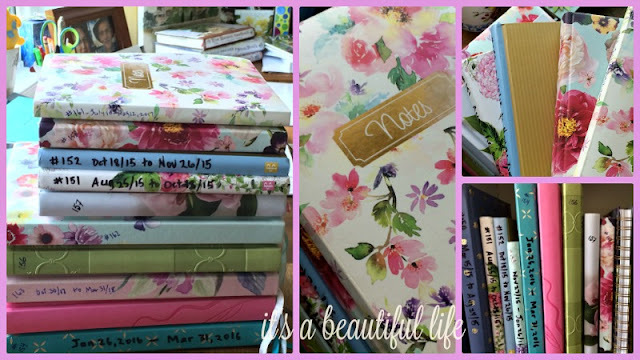 Flowers, gorgeous photos, journals, old magazines...what's not to like about this post?! I am going to start a, Junk Journal, and believe me, I have so much junk to put in it! Like you, I have saves old magazines, cut out ideas, photos, words, you name it. My husband gave me a gorgeous journal for Mother's Day, and I am itching to get started! I'm anxious to read your new segment...you write so beautifully! 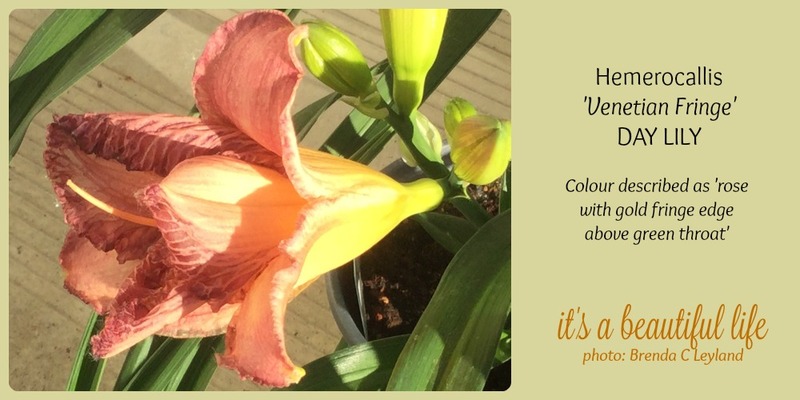 I love your new daylily, she's gorgeous! I like the idea of you being the recorder of your own history. May there be many additions to your stack of journals. Have fun in Ottawa! Karen, keeping them organized, oh yes, me too! I have them all in magazines boxes by month. So all the January, February, etc issues are together, in date order. I used to know where to find certain articles or pictures in which issue, but that part of things has kinda lapsed over recent years. Still, the search for something turns up all sorts of wonderful things. I love your posts Brenda, I feel like such a kindred spirit. I do not keep a lot of paper around, but I have saved every one of my Victoria magazines, and many, many of my journals. I threw out a bunch one time because they were just too painful to read, difficulties with depression, etc. In fact I think I've thrown out half of what I've written. Not sure that was a good Idea but really didn't want anyone else to see it all. But I too find that writing things down is a good way to sort through things and think things out. I love how you like to write on wide-lined paper so as to not crowd the words. We're like journal sisters! I also number and date (inside the cover) my journals and decorate them with stickers. I started keeping a journal when I was in my early teens and wrote regularly for about a a decade. I started journaling again a few years ago, but this time, it's a gratitude journal. I also prefer small-town living. I'm fortunate enough to live within a 5-minute drive to the rural and conservation areas. Enjoy your family trip to our nation's capital. I was glad to hear that WestJet and the WestJet pilots reached an agreement so there will be no flight disruptions.